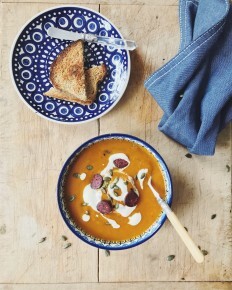 Pumpkin Soup topped with venison chorizo. If you need a more detailed recipe have a look for Pumpkin soup recipes online, this is just a rough idea how to make the soup. Roast the chopped pumpkin with scattered cumin seeds in the oven until nice browned. Sweat the chopped onion in a pan with a little oil until soft and add the garlic with the curry powder. After a few minutes add the roasted pumpkin and stock to the pan and stir to combine. Add more stock or water if the soup is too thick. Leave to simmer for a few minutes and use a blender to puree the soup. Add salt and pepper to taste. Fry the sliced chorizo in a dry pan until crisp, take out of the pan and fry the pumpkin seeds briefly. 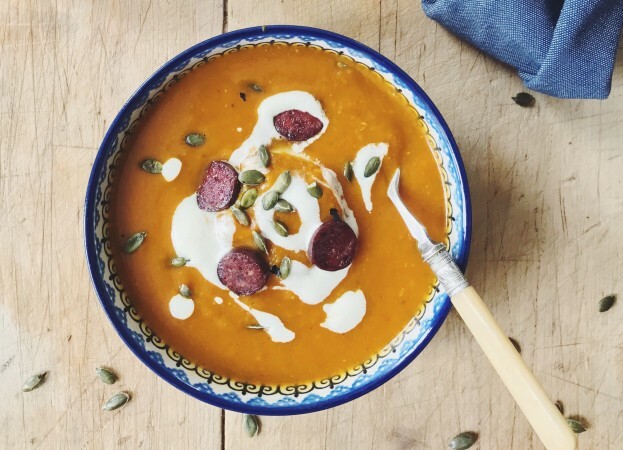 To serve, drizzle the soup with a little creme fraiche and sprinkle with the chorizo and pumpkin seeds.